CONDITION: Good: shelf and reading wear, some cover creasing, and grubby marks to top of last page. EDITION: c2006, 1st, Penguin Books. Only last month, former Booyong High student Simon 'specky' Magee led the Gosmore Grammer Knights to victory against our couragoues Booyong Lions. But now he's back in town! Well, we at the Bugle would like to welcome Simon home, but even his best mates don;t want him on the team. 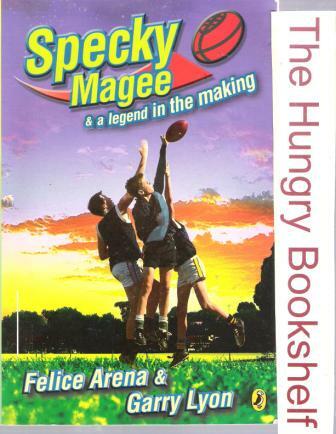 And now we can't help wonder just how 'specky-tacular' Magee really is...Will he ever play with Booyong again? Specky has questions of his own...Will Robbo and Danny ever talk to him again? What could possibly scare the Great McCarthy? And what's Screamer up to now?